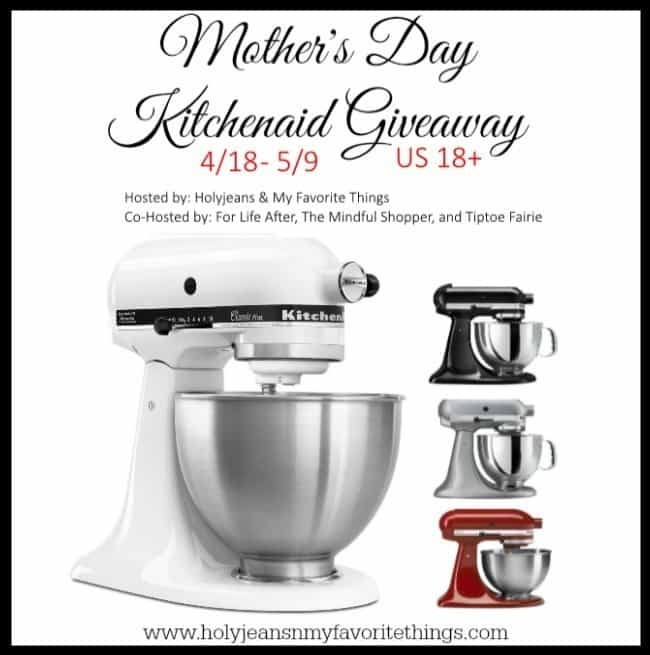 Welcome to the Mother’s Day KitchenAid® Mixer Giveaway! I’m so excited to be teaming up with our giveaway host Holyjeans & My Favorite Things and co-hosts For Life After and The Tiptoe Fairy, as well as several other great bloggers to bring you this amazing KitchenAid® Stand Mixer Giveaway. One of the coolest gifts my husband and I got for our wedding was our KitchenAid® Stand Mixer. There is something pretty spectacular about owning one of these iconic kitchen appliances. No matter your baking/cooking skill level, this mixer will definitely elevate you to the next stage of culinary rock “starness” as you mix, knead, whisk, and whip-up your signature dishes with style and ease. There are multiple options for entry in the Entry Form above- you can pick which entry options you want to use, or do all of them. If you have already done an entry option in the past, make sure to use this as an entry for the Giveaway. Don’t forget about the options for daily entries– these are easy ways to increase your number of entries. I would bake a batch of chocolate chip cookies first if I won this Awesome prize! You are a pretty nice sister! 🙂 Thanks for entering the giveaway! OMG! I cant even begin to think about exactly what I’d make! But it would be something nice for my grandson who lives with me! The first thing I would make is a batch of my Grandma’s ginger cookies!!! Yumm! I would make chocolate chip cookies!!! I would make a strawberry cake for my family. I think I’d make a home made carrot cake. My sister-in-law’s birthday is coming up, and this would be my first endeavor with the new mixer. Would love it!!! I would love to make some peanut butter cookies. I would make my Grandmother’s chocolate cake . It is our family’s favorite . I would make a Coconut cake with white fluffy frosting. Yummy! This mixer would make my cake-baking much easier. Love your site, and use it when shopping for family gifts. This would be an awesome mother’s day gift!! I would bake a cake with the mixer!! I’d use this to make nutritious meals for my family and especially my little sister – poor health. You are welcome. Thanks for entering! I never think I bake enough to justify buying stand mixer. But if I won one, that’s an entirely different matter! i will make anything my family wants, since i will be overjoyed at winning such a wonderful prize! A sweet potato cheesecake, haven’t made one of those in a while. I would make pumpkin cheesecake. I would make cookies first! I would make buckeye balls for my grandkids, it is their favorites, but with a hand mixer, it is a lot, so I usually reserve them for Christmas. I would make flower cup cakes with homemade buttercream icing!!! I love making rose cupcakes!! I would make cookies first. I would make Snicker Doodles. I HAVE BEEN WANTING TO MAKE HOMEADE BREAD! First thing I would bake if I were to win would be a mothers day cake for my amazing mom! Great giveaway! The first thing I’d make if I won this, would be some homemade bread. I would make pancake batter mix.. I just found a recipe for banana bread that is baked in mason jars that I would love to make to gift to my family and friends. I would make cookies and cakes. I would make a chocolate cake, yummy!! Thank you for the chance. I would make a whipped night creme with frankincense, helichrysum, lavender, and rose oil! Then I’d make my grandma’s famous strawberry rhubarb pie with a crumbly, buttery crust to die for! 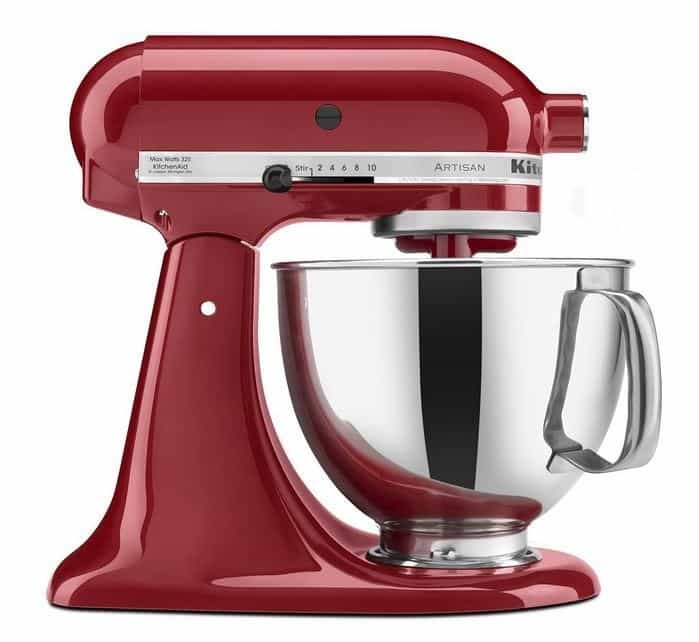 The first thing I would make if I win this Kitchenaid Stand Mixer would be a breakfast bread like zucchini or banana. Hi Amy, thank you for this giveaway. I would make a mocha swiss roll for this year mother’s day. I will be giving it to my neighbors who have been so kind when they found out I am pregnant and gave me beautiful and cute baby clothes. I will also give some to the cashier at our local grocery store since she also just gave birth! Happy mothers day. Sounds like you are a very generous person! 🙂 Happy Mother’s Day to you! i would bake a big ol chocolate cake. I would make memories with my daughter. Made from Scratch Butter Pound Cake! Yum! I would make a home made pizza, starting with fresh made dough from my new mixer! I would make cinnamon rolls. Thanks for the giveaway. Good luck everyone. The first thing I am going to make with the Kitchen Aid mixer is a Swiss Chocolate cake. Mmm….Cheesecake or chocolate chip cookies!! I would make so many cakes! I think I would make some cookies. I have always wanted this mixer. I would make a lemon bundt cake. I would make some light and fluffy bread. Maybe multigrain, maybe just white slathered in butter. If I win the first thing I will make is raspberry buttercream icing. Yummy! I would make cookies with my grandsons. Probably loaded oatmeal. The first thing I would make is bread. Actually, I will gift it to my mom and help her make bread. Thank you for the great giveaway. The first thing I would make, would be some awesome buttercream frosting! Would really like to win!! Thank you Amy that means a lot. You are generourous as well for giving this giveaway! I very much appreciate it. Gotta go with chocolate fudge brownies! Awesome prize for the lucky winner! !